Peterborough United are happy to win ugly if it leads to a place in the League One play-offs. It’s not the preferred policy of the manager or his players, but the club’s dismal run of form either side of Christmas meant a change of priorities. Back-to-back wins, for the first time since October, at Notts County and at home to Yeovil on the last two Saturdays, have justified the means and it will be a far more confident Posh side that travels to Fleetwood this weekend. “We haven’t given the greates t of performances over the last two games,” Posh star Joe Newell admitted. “But we had to get some wins any way we could and the discipline and determination to see out both games have been impressive. “We knew in the warm-up last weekend that it wasn’t going to be a pretty game, but we adapted and picked up a good result. “A 1-0 win and a scrappy gola just about summed the game up. “The manager wants to play good, passing football and so do the players, but it’s impossible sometimes and if we have to win ugly than that’s what we will try and do. “I do know that any sort of win ensures the atmosphere at training is much better and that should help us give better performances. “A winning habit is a good thing to have. “As players we don’t tend to look at the league table too much. We will focus on each game as they come along and see where that takes us. “Obviously we want to finish as high as possible, but we don’t think we should be looking too far ahead at the moment. 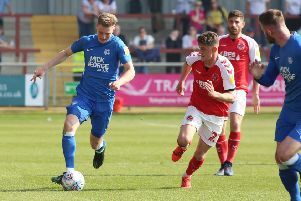 Newell’s consistent form has been a highlight of the Posh campaign and represents a fine comeback from last season when the 21 year-old didn’t receive a great deal of love from the club’s fans. Newell has played well in a number of positions, most recently as a left wing-back. “The manager just asked me to be more consistent this season,” Newell added. “Obviously you’re always more involved in a central position whereas there’s a danger that you drift in and out of games out wide.